There is a new global financial crisis emerging caused by the collapse of sub-prime lending in the United States. As with previous capital market dislocations, Australia has not been insulated from the instability. The ‘primary’ market for residential mortgage-backed securities in Australia has for all intents and purposes evaporated. The consequence of this is that smaller banks, building societies and non-bank lenders that used the process of securitisation to provide housing finance over the last decade have either severely rationed credit or withdrawn from the market altogether. As a result, the Big-5 banks have dramatically increased their share of the mortgage market, albeit at the cost of acute balance sheet pressures. Australia needs a policy solution that will guarantee the provision of the ‘public goods’ of a minimum level of liquidity and price discovery in the mortgage-backed securities market during future financial crises. Failure to act with a systematic policy response will see the heightened competition that emerged in the mortgage market over the past 10 years significantly dissipate with a likely further casualty being the low home loan margins that households have enjoyed during this period. In such an environment, home owners and businesses may not receive the full benefit of attempts by the Reserve Bank of Australia to reduce interest rates. 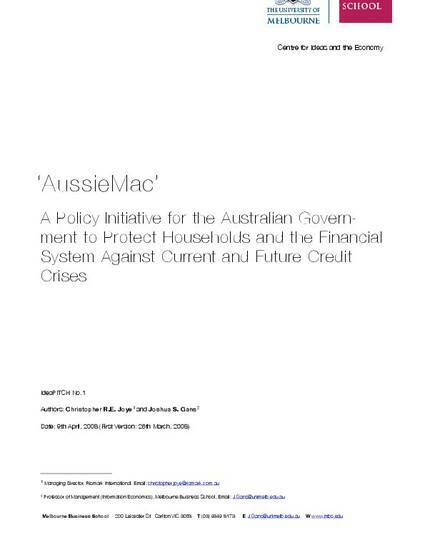 We propose that the Commonwealth Government sponsor an enterprise – ‘AussieMac’ – that would leverage the Government’s AAA-rating to issue low-cost bonds and acquire high-quality mortgage-backed securities from Australian lenders just as Fannie Mae and Freddie Mac have done in the United States (and the CMHC in Canada). AussieMac’s role as a long-term liquidity provider would be especially important during periods of capital market failure when third-party funding for Australian home loans can disappear with potentially dire ramifications for the financial system. While this enterprise would have to be closely monitored and controlled, it would not constitute a significant near-term drain on public funds. Instead, it would restore stability and long-term confidence to both the primary and secondary mortgage markets in Australia and ensure that the vigorous level of competition that has characterised the housing finance industry will continue into the future.